One day before International Women’s Day, nationally renowned immigrant rights and reproductive rights organizer and long-time Mijente member Alejandra Pablos was detained by ICE. She is the latest immigrant rights advocate facing deportation and is currently being held without bond at Eloy Detention Center in southern Arizona. Since her detainment last Wednesday, Ale has received an immense outpouring of support, a testament to how much Ale’s spirit and activism has impacted our community, our movement, and our personal journeys. Her detainment is devastating, but we need to channel her spirit to do as she requested: Fight for her on the outside as she is fighting inside. 1. Sign & Share Petition. 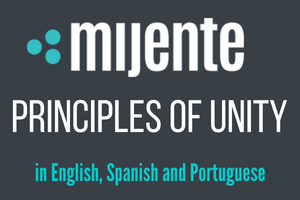 With your support, Mijente has collected over 20,000 signatures on our petition demanding that ICE release Ale on bond–and we know we can get thousands more! If you haven’t already, sign and share the petition on your social media pages and groups. 2. Donate to Ale’s Defense Fund. Ale faces an uphill battle to fight her deportation. Your financial support will provide the resources she needs to fight her case. 3. Organizational Letter of Support to Judge. Use this template to have your organization write a letter to the judge expressing your support for Ale. 4. Personal Letter of Support to Judge. Use the second page of this template to send your own personal letter to the judge detailing your support for Ale. 6. Host a letter-writing party. Letter-writing parties are already under way. Gather in community at your home, local cafe, or library. 8. Show up for her bond hearing in Arizona. The bond hearing will be the strongest place to show the judge how much Ale is loved and supported, so we want to show up. Once the hearing date is set, we’ll share the date widely and ask for your in-person support. 9. Create art. Art is resistance. Join the artists who have created beautiful art in support of the #ReleaseAle campaign. 10. Keep Ale’s story alive. Share Ale’s story every week on your social media channels to keep her name and story active online. Follow @Mijente to stay on top of the latest news about Ale’s case and share details of her case. 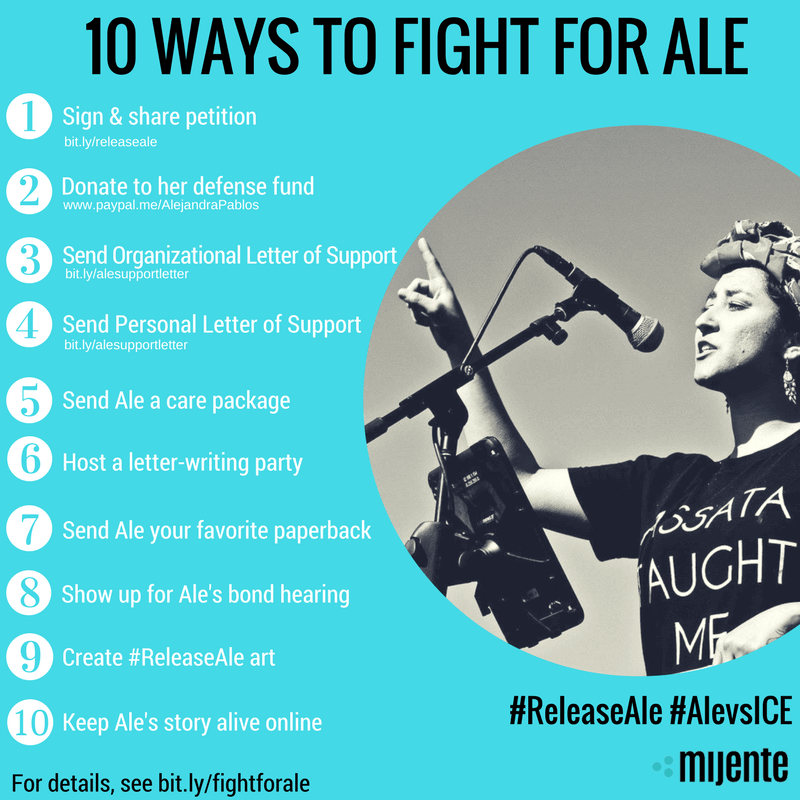 Include the campaign hashtags #AleVSICE and #ReleaseAle in your posts.